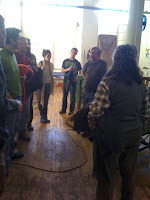 On Thursday we went as a class on a trip to 3 professional woodworker's shops. Here is a picture of us listening to Kevin Rodel in Brunswick. The men were all extremely generous with information and time. 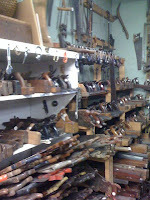 I went to Liberty Tool on Saturday, a famous local source for wood workers looking to rummage through 8 tons/8 million possibilities. 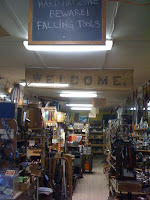 I scored a few simple treasures, then perused their museum across the street. On my way home I passed through Lincolnville, a town right on the beach, just as they were lighting their tree. There was a small crowd and large bonfire and the sun was just setting, quite a sight. The tree lighting sounds wonderful. Miss you.